We'd love to hear from you! Contact us by email or phone using the information below. The Cognitive and Behavioral Neuroscience Program is located in the Neuroscience Building or Cox Annex. 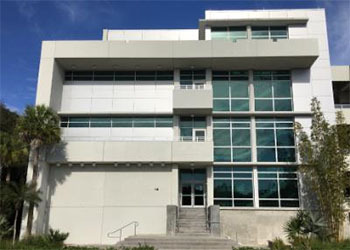 The University of Miami Neuroscience Building (Cox Annex) is located at: 5151 San Amaro Drive, Coral Gables, FL 33146. If using GPS, it may be easiest to enter 1301 Memorial Drive. Take US 1 South to Ponce De Leon Blvd. Turn RIGHT onto Ponce De Leon Blvd. Take Ponce De Leon 1 mile south to San Amaro Drive. Turn RIGHT onto San Amaro Drive. 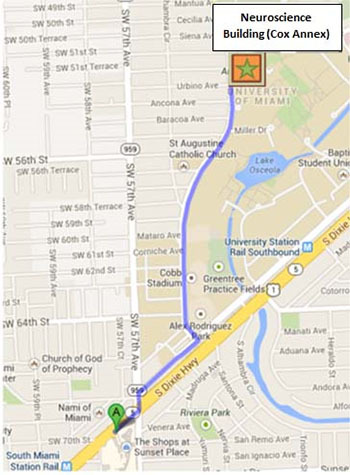 Take San Amaro Drive 0.8 mi north to Memorial Drive. Take US 1 North to Red Road. Turn LEFT onto Red Road. Take an immediate RIGHT onto Ponce De Leon Blvd. Turn LEFT onto San Amaro Drive. Take San Amaro Drive 0.8 mi north to Memorial Drive. Visitors may park at a meter or purchase a parking pass to park in the dedicated visitor parking areas (e.g., Pavia or Flipse Garages). For more information about options, please visit the University's "Where to Park" page.